With their resurgence in popularity, Hydrangeas have finally gained the appreciation they truly deserve. More than just the standard bigleaf mopheads that had been so popular forced in greenhouses for Mothers Day, from obscurity have emerged the climbing species (H. anomala petiolaris and its relative, Schizophragma hydrangeoides), the bold Victorian-era large-panicled flowers of H. paniculata, and dainty lacecaps and increased winter hardiness provided by H. serrata. Our hydrangea selections oblige the desire not only for the diversity of flower (inflorescence) forms – from lacecap to mophead to panicle – but offer varied stem color, leaf color and texture, plant size, and winter hardiness. Looking for a native plant? Cultivars of H. quercifolia and H. arborescens fill the bill. Where Should I Plant My Hydrangea? No matter their nativity, Hydrangeas in general are woodland understory plants and thrive in moist but well-drained soils amended with organic matter (humus, leaf mold, compost). Most species tolerate a range of pH conditions. However, the H. macrophylla and H. serrata cultivars are unique for their flower color being determined by the relative acidity of the soil: a pH below 6 (acidic) will usually produce flower color closer to true blue, whereas a pH above 6 (more alkaline) will produce flowers more pink. Add aluminum sulfate to soil to make flowers bluer or add lime to soil to make flowers pinker (apply to plant root zone in late autumn or early spring). 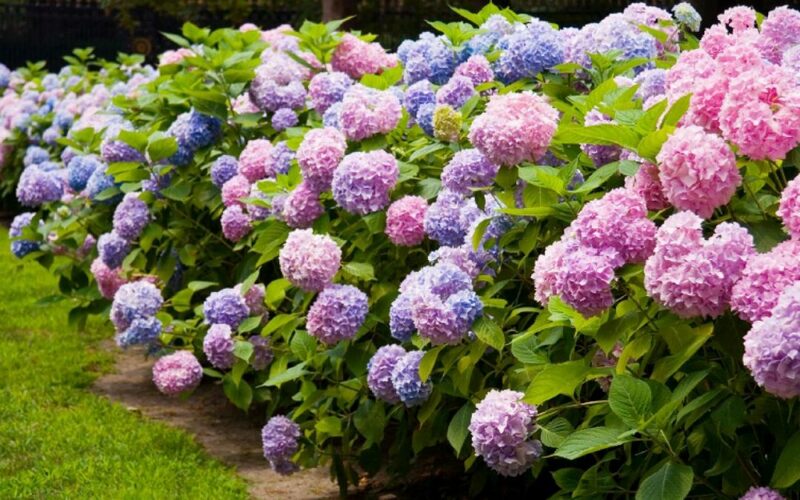 If your soil is already extremely acidic (pH 5.5 or lower) or extremely alkaline (pH 7 or above), it might be very difficult or impossible to change pH sufficiently to change the flower color of your hydrangea. Although partially shaded conditions are ideal for most hydrangeas, sunnier sites encourage flower production – as long as consistent soil moisture is maintained. H. paniculata thrives in full sun and tolerates drier soils more than other hydrangeas. How Do I Plant My Hydrangea? Keep rootball moist (but not soaking wet) until planting. If you are unable to plant soon, keep the plant outdoors in a sheltered, shaded location away from direct sun and wind. At planting, dig a hole only as deep as the rootball, but at least as wide as twice the diameter of the rootball (the wider the hole, the better!). Add humus (compost, peat moss, etc.) to the soil removed from the planting hole before backfilling. Loosen the roots of your hydrangea – don’t be afraid to cut the outer roots to break them free before backfilling, so that the roots have good contact with the soil. Make sure to keep the plant high enough when backfilling so that the finished soil surface is even with the top of the original rootball. Remember: digging and planting too deeply is one of the most common factors contributing to the loss of newly planted shrubs. Water-in well to soak the soil and encourage soil contact with the roots. What should I do in order to have my hydrangeas increase in beauty from year to year? When Should I Prune a Hydrangea? Remember that mophead and lacecap macrophylla and serrata cultivars bloom on stems formed the previous year ( known as "old wood"). Usually these species require very little pruning. If absolutely necessary (to reduce plant height, or to remove dead stems on old shrubs) prune these immediately after flowering; pruning delayed until late summer or fall might sacrifice the following year’s flower display. Hydrangea aspera blooms on old wood like the above three species, but because it is prone to lanky, leggy growth the aspera types can be pruned back for the first three years after planting to encourage more compact growth. Although flowering will be sacrificed during this time, you will be rewarded with a fuller shrub structure and flower display in the future. Hydrangea quercifolia is like the above two and usually requires little if any pruning. Hydrangea arborescens and Hydrangea paniculata types can be pruned in early spring and will bloom that year on the new growth ("new wood"). After it is established about three years, H. arborescens can be pruned within 6" of the soil line each spring and will rejuvenate vigorously.